Elen Harutyunyan, center, receives the prestigious Margaret Criswell Disert Honors Scholarship from Dean of the Faculty Elissa Heil, left, and President Barbara K. Mistick, right. 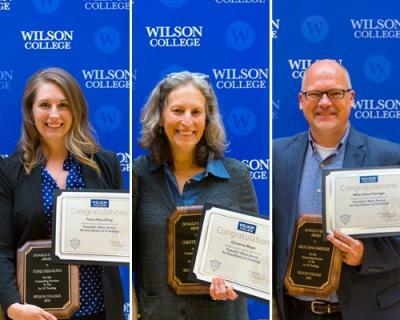 Wilson College honored students and faculty members at its annual Academic Awards ceremony held Friday, April 27, in the Harry R. Brooks Complex for Science, Mathematics and Technology. Edward and Sarah Anderson Psychology Prize, which is given to a graduating senior for outstanding scholarship in the discipline of psychology, was awarded to Abigail Selman. James Applegate Award, which is awarded to a student with an interest in drama and theater, went to two students: Francesca Giustini and Myah Quirin. Suzanne Blumenthal Prize in French, which is awarded to a graduating senior for academic excellence in the disciplines of French language and Francophone cultures, was given to two students: Ashley Carbaugh and Abigail Siner. Stephanie Peebles, pictured here with President Barbara K. Mistick, is the first recipient of the Lt. Col. William A. Knaus Award for Veteran's Service. 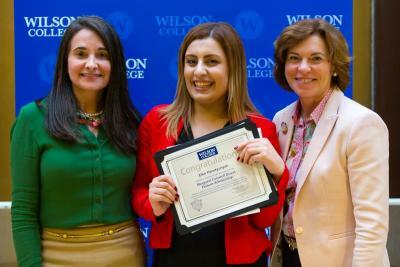 Lucy Bremmer Global Citizenship Award, awarded to a student who participates in the service learning component of Wilson’s global citizenship initiative and provides assistance with expenses and travel to another country, was given to Elen Harutyunyan. Alice Martin Brumbaugh Award in Sociology, which is given to a female student who has entered the college at a non-traditional age and shows a special interest and/or outstanding promise in the field of sociology, was awarded to Jessica Larkin. CRC Press General Chemistry Award, given for outstanding achievement in general chemistry, was awarded to Rianon McKee. Marel Harlow Cheng Memorial Prize, awarded to a student who has done well in international studies or has made some noticeable contributions to international understanding, went to Elen Harutyunyan. 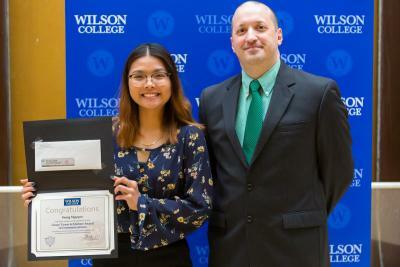 Class of 1957 Civic Engagement Award, given to a student who exemplifies civic engagement at Wilson College through involvement in volunteer roles on and off campus, was awarded to Sina Kim. Virginia Dodd Cooper Prize, awarded is a junior or senior who has demonstrated excellence in French and in all of his/her academic work, went to Heather Schuler. Recipients of the Bletz teaching awards, from left, Tonia Hess-Kling, Chris Mayer and Dana Harriger. Regina Shaputnic Cuomo Mathematics Award, given to a student or students who exhibit outstanding ability and are pursuing a major in mathematics, was awarded to Benjamin Wingerd. Margaret Criswell Disert Honors Scholarship, given to a rising senior who has, in the judgment of the selection committee, submitted the proposal for senior advanced study and research considered most worthy of support, was awarded to Elen Harutyunyan. Estep-Lawson Memorial Prize, awarded to a student in lower-level French course who demonstrates excellence and shows future promise in French studies, went to Francesca Giustini. Mildred Franklin Prize, given to a senior for excellence in Latin or Greek and who has shown an understanding of the literature and thought of ancient civilizations, was awarded to Karis Daniel. Donna Gomer VMT ADP Award for an adult degree student displaying excellence in the study of veterinary medical technology went to Sarah Beers. 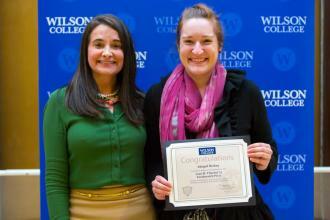 Cierra Valentine, left, receives the Catherine Herr Langdon Award from Dean of Students Mary Beth Williams. Davison Greenawalt Grove Award, which is given to a member of the junior or senior class participating in research in physical and life sciences, was awarded to Karis Daniel. Richard C. Grove Award in Business and Economics, which goes to a student who has demonstrated outstanding ability and distinguished themselves academically in accounting, business administration, financial mathematics or economics, was awarded to Cody Dunlap. Dorle Haas Memorial Prize, awarded to a senior for outstanding service within the greater Chambersburg area, was given to Catherine Cummings. Margaret Strode Haines Award, which recognizes a student with outstanding qualities of scholarship, interest in the humanities and strength of body, mind and spirit, was given to Stephanie Peebles. Aurora Ortiz, recipient of the Gloria Randle Scott-Frances Richards Hesselbein Prize, with Dean of Students Mary Beth Williams. 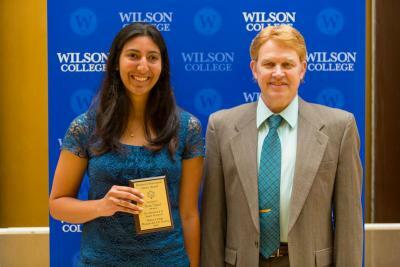 Gloria Randle Scott-Frances Richards Hesselbein Prize, awarded to the senior who has demonstrated outstanding volunteer service during their four years at Wilson College, was given to Aurora Ortiz. Joanne Harrison Hopkins Literary Achievement Award, given for the finest piece of imaginative literature in fiction, poetry or drama produced during the academic year, went to Evan Hoke. Lt. Col. William A. Knaus Award for Veteran’s Service, which is awarded in memory of Lt. Col. William A. Knaus─father of Wilson College President Barbara K. Mistick─to the veteran in the senior class with the highest academic achievement, went to Stephanie Peebles. Josef Michael Kellinger German or Foreign Language Award for a student who has demonstrated excellence in German or foreign language studies was given to Dasia Edwards. Davison Greenawalt Grove Award winner Karis Daniel, left, with Associate Professor of Biology Brad Engle. guidance, help and understanding to fellow students during the year and was awarded to Cierra Valentine. Mary-Eleanor Maule Travel Grant, awarded to graduating seniors or students entering their junior or senior years for travel planned in support of study in Spanish, was given to Elen Harutyunyan. Alta Lindsay McElwain Prize, awarded to the best student in Latin or Greek in the freshman class, went to Amanda Leatherman. Robert Shannon McElwain Prize, awarded to the best student in mathematics, went to Nicholas Beitzell. Organic Chemistry Award, given to the student in organic chemistry who earned the highest grades for the year, went to Abbey Heinbaugh. Outstanding Peer Teacher Award, given to honor exemplary service as a First-Year Seminar peer teacher for the year, went to Pratikshya Gaihre. Nicky Hoffman Reich Award, given to the student whose work with animals shows commitment to humane treatment, was awarded to Trista Kalathas. Heather Paxson, left, the first recipient of the Wilson College Nursing Leadership Award, with Associate Professor of Nursing Julie Beck. 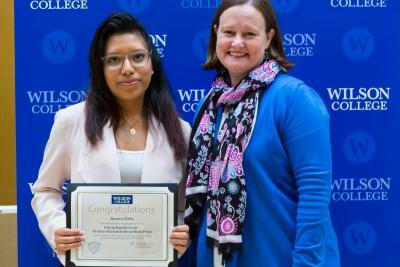 Helga Rist Prize, which is given to a dedicated, successful, American Wilson College foreign language student who has demonstrated integrity, promise and potential, was awarded to Aurora Ortiz. John D. Rose Award in Environmental Studies, given to an outstanding junior majoring in environmental studies or biology to fund a summer research project or internship, went to Mackenzie Bindas. William and Ivy Saylor Prize, established through the Academy of American Poets to support young poets at colleges nationwide, was awarded to John Uilkema. Grace Tyson Schlichter Award in Communications, which is given to a senior who has shown general academic excellence and outstanding promise for a career in a field of communications, went to Hong Nguyen. Mary Beers Sheppard Prize, awarded to the member of the senior class who has shown the keenest understanding and appreciation of literature, was given to Kirsten Bilger. Sophie’s Six Award, given to a senior who is majoring or minoring in psychology or related field with an intended career in counseling, was awarded to Aurora Ortiz. Hong Nguyen, winner of the Grace Tyson Schlichter Award in Communications, with Assistant Professor of Communications Jonathan Long. Joan M. Thuebel ’52 Earthwatch Prize, which sponsors a Wilson student or faculty member to participate in an Earthwatch Institute project of his or her choosing, was awarded to Wilson Assistant Professor of Biology Abigail Berkey. William P. Van Looy Business Prize, awarded to the junior or senior business and economics major who has demonstrated excellence in business studies and in service to the well-being of both the Wilson College community and larger community, went to two students: Katrina Martin and Hong Nguyen. E. Grace White Prize, which is awarded to a senior whose major field is biology or biochemistry, and who has demonstrated outstanding achievement and plans a career involving the biological sciences, was given to Deborah Rifflard. E. Grace White Summer Scholarship, which is awarded to outstanding juniors in biology for use at approved laboratories, was awarded to Zack McMaster. Abigail Selman, right, the recipient of the Edward and Sarah Anderson Psychology Prize, with Assistant Professor of Psychology Steven Schmidt. 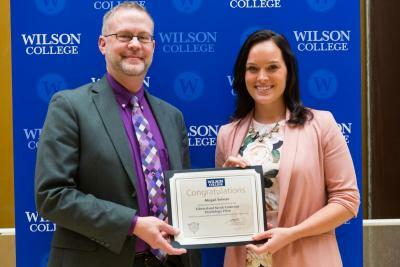 Wilson College Education Award, given to one elementary education major and a student preparing for teacher certification in a secondary school level who have shown outstanding achievement in both their academic studies and in their professional preparation, was awarded to Stephen Sniscak and Angela Suehr. Wilson Equestrian Award, which goes to a graduating senior who has excelled in academics and equitation, went to Haley Glofka. 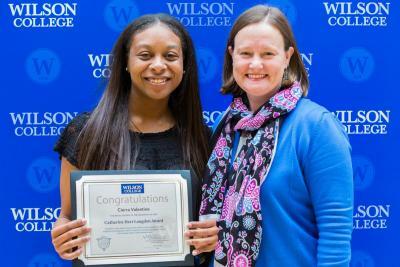 Wilson College Nursing Department Award, which is awarded to a student who has demonstrated continuous support of the nursing department through hard work and efforts that echo the department’s philosophy, was given to Sierra Watson. 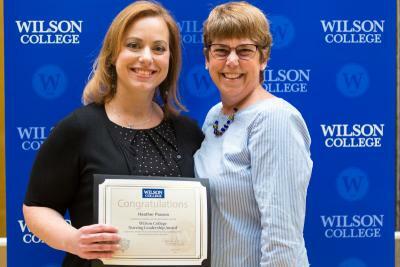 Wilson College Nursing Clinical Leadership Award, given annually to a student who demonstrates outstanding overall ability to excel in his or her clinical work within the nursing program, went to Beverly Meyers. 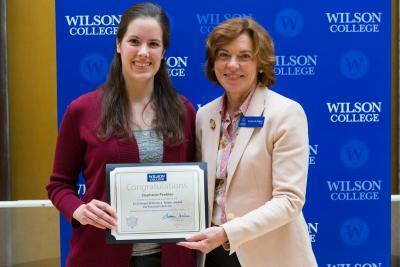 Wilson College Nursing Leadership Award, presented to a student who has demonstrated nursing leadership abilities both outside and inside the classroom, was awarded to Heather Paxson. Right, Joan M. Thuebel '52 Earthwatch Prize winner Abigail Berkey, assistant professor of biology, with Dean of the Faculty Elissa Heil. Wilson College Scholar-Athletes, those who have maintained a grade-point average of 3.4 or higher and participated in at least one Wilson varsity athletic team, are: Marquise Beckett, Ashlee Buorquin, Alycia Brennan, Kristen Burdo, Kallie Butts, Jennifer Cail, Kirstyn Fogg, Amanda Haase, Evan Hoke, Ashley Horn, Timothy Horn, Brianna Martin, Lauren Moss, Oliver Perry, Megan Potter, Lee Price, Noemi Regan, Aaron Russ, Ethan Russ, Katie Shank, Alison Shockey, Justin Vizzi, Amber Watkins and Benjamin Wingerd. Carolyn Zeleny Prize, which goes to a sociology student in the junior or senior class on the basis of academic excellence and/or community service, was awarded to Amber Watkins. Several faculty members were honored during the awards ceremony, including the following faulty who received the Donald F. Bletz Award for Excellence in Teaching: senior faculty award, M. Dana Harriger, professor of biology; junior faculty award, Tonia Hess-Kling, assistant professor of exercise science; and adjunct faculty award, Christine Mayer, adjunct instructor of environmental studies and director of the Fulton Center for Sustainability Studies.